General Application: Offers the benefits of a patellar tendon strap, plus greater warmth and additional support. Medical Application: The Lift alleviates conditions of tendinitis, chondromalacia, arthritis, Osgood-Schlatter's Disease and other knee ailments. 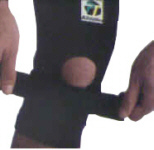 How it Works: Elastic strap over infrapatellar buttress provides a gentle lift to the patella, relieving pressure. In addition, compression on the patellar tendon helps spread pressure uniformly across the patellar tendon, reducing discomfort and irritation. 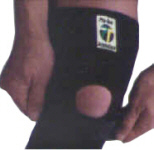 Knee sleeve will provide warmth and compression, promoting circulation, which can enhance the healing process. 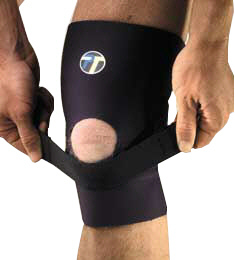 Design Theory behind the Lift: The Lift combines the benefits of a patellar tendon strap and a knee sleeve. The user can control the amount of support they deem necessary by adjusting the elastic patellar tendon strap. The infrapatellar buttress provides additional support as the strap is stretched over it. This support of the patellar tendon combines with the warmth and compression of the knee sleeve to offer a truly unique, functional knee brace. Exterior strap stretches over buttress allowing user to control lateral and medial patella tracking as well as pressure on the patella tendon.